Traceability refers to the ability to verify the history,location, and application of an item via documented recorded identification, thus enabling the recall of goods based on precise date/time and location information. One of the world's leading providers of beverage containers required a system to identify bar codes and alphanumeric characters on ink-jet-printed labels at a run rate of 7 units and minimum 99.9% accuracy. Since there were few engineers in the factory, the customer sought to implement a reliable system with an easy-to-use GUI for workers with a less technical background. Advantech provided a PC-based automated optical identification system with multiple cameras to identify bar codes, data codes, and characters on beverage containers. The system included an AIIS-3400P 4-channel PoE compact vision system with an Intel® 6th / 7th generation Core i CPU;Inspector Express, a GUI machine vision application specifically designed for easy design and deployment of automated inspection on the factory floor; and QCAM-GM0640 0.3-MP industrial cameras with PoE for simple installation and maintenance. 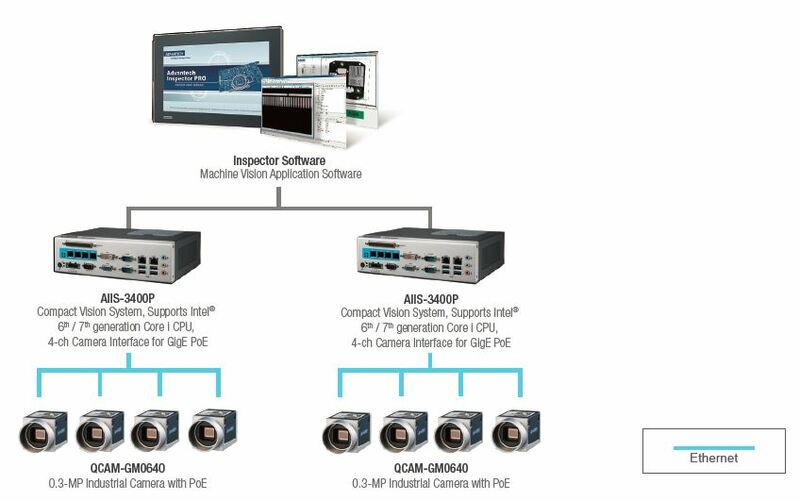 Advantech Inspector Express facilitates building and deploying machine vision applications without any programming skills. It supports a wide range of Advantech industrial PCs, smart cameras, and embedded systems, and can be deployed on different hardware platforms without modification. The AIIS-3400P's series’ support of PoE combines power and signal supply into a single cable, and GigE Vision compliance and the system’s compact size further simplify installation and maintenance.